Richard Borg heads into Space in this exciting new Commands & Colours board game, including two complete fleets of plastic starships! 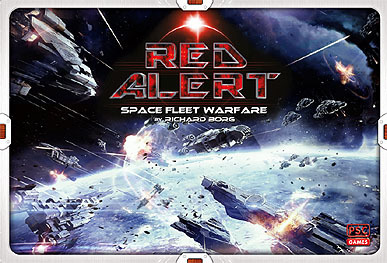 RED ALERT allows two to six players to duke it out in Space using the opposing fleets of the Commonwealth Alliance and Rebel Confederation: battleships, cruisers, and destroyers, backed up by long-range fighters and the Fleet Commander's all-important flagship. The play of command cards drives the action and creates a 'fog of war', while battle dice resolve combat quickly and efficiently. Combat cards add an element of suspense, and challenge players to maintain their star token reserves to power decisive actions throughout the battle. The action on a combat card hay hinder the opposition forces, enhance a player's units, or instantly change the course of a battle. An assortment of Task Force cards allow players to quickly deploy a fleet of starships that can be augmented and customized with support vessels. RED ALERT's fleet customization rules and challenging scenarios provide an almost endless amount of replay value.